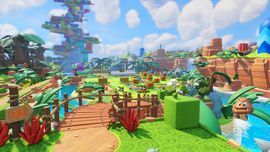 Ancient Gardens is the first world in Mario + Rabbids Kingdom Battle. 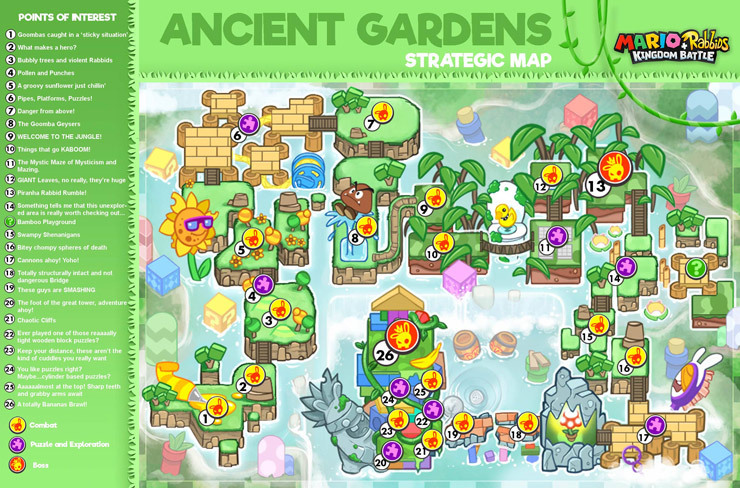 It is a grassland and jungle area located to the east of Sherbet Desert, consisting of many flowers, water streams, immobilized Goombas, and a towering block structure. Mario and co. first land in Ancient Gardens just after the SupaMerge headset merges with Spawny. They venture through the grassland area and get past the Sunflower before they reach Peach's Castle. After briefly reconciling with Princess Peach, Mario and co. take a cannon to enter the jungle area of Ancient Gardens, where they find and defeat Pirabbid Plant and recruit Luigi. As Mario and co. exit the jungle area and enter the base of the block tower, they encounter Toad, who warns them of an enemy on the tower. Mario and co. manage to make it to the top of the tower, where they encouter Bowser Jr., who takes Spawny and uses him to create Rabbid Kong. After defeating Rabbid Kong, Beep-0 reports that Bowser Jr. had fled to Sherbet Desert, thus revealing their next destination. The Ancient Gardens span five different sectors, each with its own marks. They are delimited below as they are in the game on the area selection screen after beating Rabbid Kong. The Goomba Grove is a grassland area and the world's starting point. It owes its name to the few Goombas that populate it. A lot of bees and butterflies thrive in this area. The area begins with a wide strip of land surrounded by water. Trees with peculiar cubical crowns and Goombas stuck in honey, as well as flocks of little birds that rest on the ground, appear along this section. These are soon followed by two small battlefields, which are continued with a long grassy footpath that weaves between trees, colored pipes and flowers. A broad park opens at the end of the footpath, containing toy blocks and arrays of trees with orange bubbly crowns. The park can be explored for bonuses, which are obtained by solving puzzles among the toy blocks. However, the heroes can simply follow a snaking path to get to the next area, the Pollen Plains. The Pollen Plains is a sector that comprises vast fields, followed by large wooden piers and highland terrain. The orange bubbly trees from the previous area continue to appear here. The name of the area is a reference to the bees and butterflies that are found here. The area begins in front of a wide battlefield. Past the battlefield, a bridge crosses over to a series of wooden piers built above a water basin. Bridges raised on stilts, as well as pipes, are used extensively to move between piers. Notably, a giant garden hose rests in the water, though it serves no gameplay purpose. Beyond the piers, several snaking bridges lead the way to some plains where battlefields are established. Past a meandering walkway and another battlefield surrounded by Goomba Geysers, there is a long wooden bridge that rises over a palm tree canopy, leading onto an elevated thicket that hosts a battlefield. This place precedes the start of Flushy Forest. The Flushy Forest is an area with rich palm vegetation grown on highlands. Recurring elements in the Flushy Forest are Piranha Plants with lamp-like fixtures, which lie on the sidetrack in dimly lit parts of the forest. The area begins with a long rope bridge that crosses a chasm, passing by a gigantic mossy toilet with a rubber duck floating inside it. At the end of the bridge, the heroes enter a heavily forested area with a labyrinth, The Mystic Maze of Mysticism and Mazing, which contains hidden stone walls that rise from the ground as they are approached, blocking the path. As such, the heroes must find a path with no walls that obstruct their progress in order to escape the labyrinth. A short while after this, the heroes enter a battlefield in another forested area. Past a few more bridges and some giant leaves that obscure the path is another battlefield where Pirabbid Plant is fought in World 1-4. Once the heroes beat the midboss, they can continue on to the Bamboo Islands. The Bamboo Islands is a wetland region that extends with several grassy plateaus, followed by wooden piers built above a foamy lake. The beginning of the area is a long bridge that weaves between bamboos, water lilies and reed. The bridge leads to a series of islands that are connected via wooden footbridges. These islands contain toy block enclosures that house coins and chests, and can be unlocked by activating different switches throughout the area. Past the wetland, there is a composition of grassy plateaus where two successive battlefields are established. Bridges form a track on these plateaus, leading into an lake area with several piers. The waters in this area contain a lot of soap foam, owing to the soap solution that has spread into the waters from a gigantic tube. On the piers, there are some switches that can be toggled to adjust the position of a Cannon and some footbridges that help the heroes advance to the next area. A bridge cuts between two large waterfalls and over a river stream and leads into a short forested area before the Sunset Bridge. Sunset Bridge is a massive paved structure that leads to a tower. However, the bridge is heavily eroded and ruined, with large gaps that disrupt it. Cannons are readily available to help the heroes cross these gaps. There are two battlefields in this area, and from the second one there is a short pipe that leads to the base of the tower. The tower is a stack of massive toy blocks sustained by a large Smasher statue. Starting from the base, the heroes can use numerous pipes to climb the tower and explore the grassy terraces that stick out of it on their way. The first two battlefields in the area are each followed by a puzzle where the heroes need to use switches in order to connect a pipe that leads them further up. In the first section, activating a switch of a certain color causes the block of the same color to move gradually from side to side, bringing the part of the pipe that is adjoined to it in a certain position. The second section contains a column of disc-shaped blocks that rotate around when their switches are flicked, moving the affixed pipes along with them. Building blocks can be seen falling from the tower as the heroes approach the top, where the battle against Rabbid Kong takes place. The waters surrounding the Sunset Bridge and the tower are dotted with DK Barrels that float on the surface. The player can find giant bananas and banana peels lying around the base of the tower, marking Rabbid Kong's presence. 1-1- Unlikely Heroes A tutorial style level with many Ziggies. 1-2- Flower 'Bud' A level that features the Sunflower as a minor NPC. 1-3- Danger From Above A level that introduces Hoppers and the TactiCam. 1-4- Welcome to the Jungle A level where techniques and Super Effects are introduced. 1-5- Brother, Where Art Thou? A level where Pirabbid Plant is fought. 1-6- On the Bubble A level where the Chain Chomp as a stage hazard is introduced. 1-7- Do U Stack Up? A level where Smashers are introduced. 1-8- Precarious Pillar A level with several Ziggies and Smashers, as well as a Chain Chomp. 1-BOSS- Top Banana A level where Rabbid Kong is fought. 1-S- The Hidden Bridge A secret level featuring a rematch against Pirabbid Plant. This page was last edited on February 13, 2019, at 06:36.